During one of my usual trips to the Globe Telecom Business Center at Ayala Center Cebu to cash out from GCash, I picked up one of their flyers advertising Globe Broadband WiFi. It's the internet plan recommended for multiple Internet users in one place. With a 24-month contract or "lock-in" period, you can get a free WiFi router for your home to share access to the Internet with your family and friends. Priced at only Php 999.00 per month with a Php 500.00 one-time set-up fee, you can already surf the Internet at speeds reaching 1 Mbps. 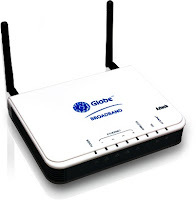 For those who want Internet access bundled with landline, prices start at Php 995.00 to Php 1,995.00, depending on the choice on Internet speed cap. The set-up fee is waived for this plan. The actual Internet speed may vary depending on computer hardware/software specs, the number of people simultaneously using the connection, and the traffic to the site being visited. Further, some selected areas in the Philippines cannot avail a wired plan and are therefore offered wireless plans but at less surfing speed. Either submit proof of financial capacity or make a Php 500.00 advance payment. The information on this post is based on the flyer I obtained. Eventually, the info may no longer be accurate. Hence, it is best to check out the Globe Broadband official page. You can also call Globe at (02)730-1000 for Globe Landline and 211 for Globe/TM mobile for more details.